Thank your for sharing Maria's letter. It's beautiful. How lucky we were to know and love Flopsy and what a lucky bunny she was to live with you all. Love and hugs and profound sympathy; bunnies do have a special place in heaven, like the incredible place we always have for them in our hearts. What a beautiful letter and how well Maria expresses her sentiments. 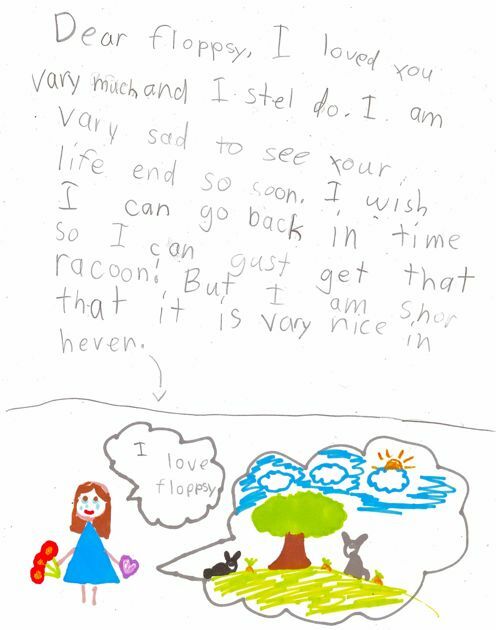 Poor Flopsy - I too wish Maria could go back in time and just get that racoon. I'm not a psychiatrist, but it looks like every one of the stages of grief is in that letter. What a healthy child you have raised. Do tell her that many of us out here in Internetland are sad to see Floppsy go, too--though not as much as she is, that's certain. I am so sad that Flopsy is gone. And happy that she was so well loved. And sad that she went through such a frightening experience. And happy that she had a few days after that to be snuggled and loved and to remember that the world is a good place, too. And sad again that she is gone. Rest in peace, Flopsy. Maria, I'm sorry about this loss. are a comfort to us all. so so sorry about sweet flopsy. what a letter. maria, we are thinking about you all the way in colorado! Dear Maria, I'm sorry that you lost your snuggly bunny. It's so sad to lose a friend. I was so sad to read of Flopsy's passing this morning when I checked "Chicken Blog." What dear friends our animals are to us. Maria, Flopsy loved you too and will love you always. You were a good friend to her. I'm so sorry...teary eyed, in fact.